Coarsely chop the cranberries in a food processor (if you have one), otherwise coarsely chop by hand. Set aside. 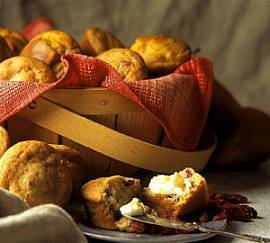 Preheat oven to 375 degrees F/190 degrees C. Grease muffin pan or line muffin pan cups with paper muffin liners. Sift together flour, sugar, baking powder, baking soda and salt. Cut in shortening until mixture resembles coarse cornmeal. In a small bowl combine orange juice and grated orange zest with well beaten egg. Pour mixture into above flour mixture, combining just enough to moisten. Fold in coarsely chopped cranberries and chopped nuts (if using). Spoon mixture into prepared muffin pan cups or paper muffin liners, filling about 1/2 full. Bake in preheated oven for 30 minutes. Let muffins cool in pan for 10 minutes, then transfer to wire rack to cool completely. Batter may be used to make a loaf bread, if desired. Spoon batter into a greased 9 x 5 x 3-inch loaf pan and bake in preheated 350 degree F/180 degree C oven for approximately 1 hour or until golden and toothpick inserted into center of loaf comes out clean. Let loaf cool in pan for 10 minutes, then transfer to wire rack to cool completely.